The Paul Pry, Worcester, November 5th 2018. 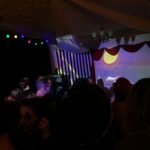 A night of Halloween freakish fun commissioned by The Paul Pry Worcester featuring live music from The Pink Diamond Revue. 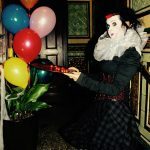 With dark circus characters, magicians, sideshow games such as apple bobbing, card games, fake fortune telling and a roaming Photo Booth. 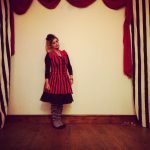 The back room of the pub was transformed into a circus tent, with drapes, a stage area and sideshows along the walls. 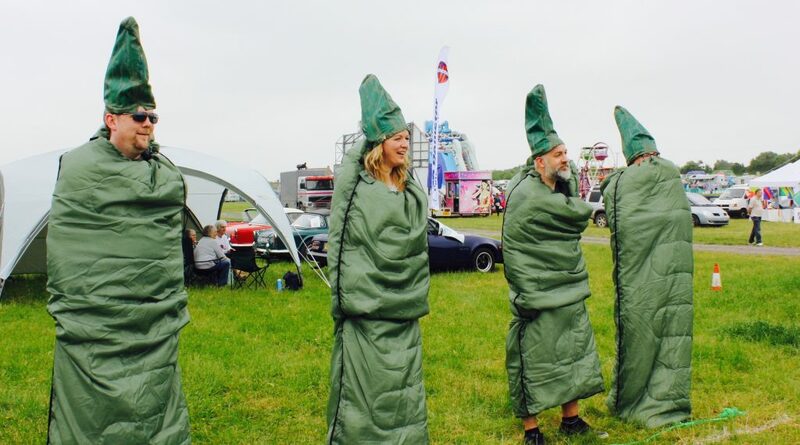 Green Man Festival – Brecon. Aug 2017. This immersive piece took influence from Welsh folklore tales about the ‘Animal Allies’; the animal guides who help you throughout life. 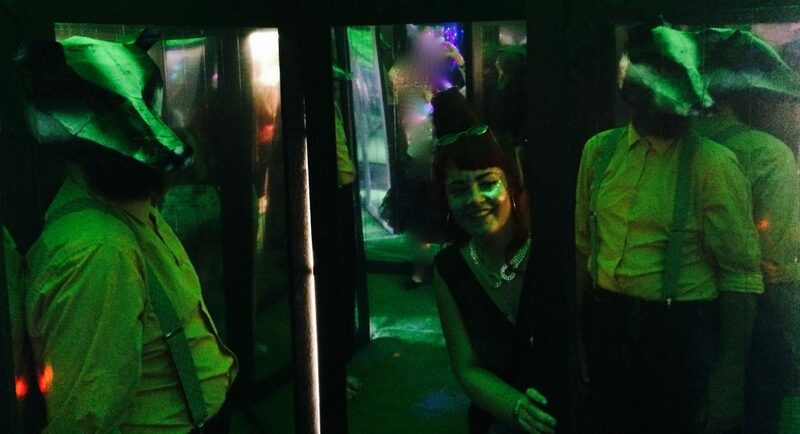 A development of the previous years installation ‘Cabinet of Strange Reflections’, (a mirrored maze with a small performance space where the animals lived), ‘Animal Allies’ takes the same five animals, and gives them extra personality drawing from these beautiful folklore tales; badger, hare, fox, raven, owl, each animal acting as an individual guide. Badger (Broc): determined and courageous. Badger will guide you during your dreams. Fox (Sionnach): cunning and sly, Fox has the ability to make fools out of those who chase it. Fox watches the movements of others while remaining unobserved. Hare (Gèarr): A sacred animal associated with foresight, transformation and intuition. Owl (Cailleach): Owl leads you to and through the Underworld. Owl can help unmask those who would deceive you or take advantage of you. Raven (Fitheach): Treat the Raven with caution. Raven represents the upsets and life crises necessary for something new to be created. 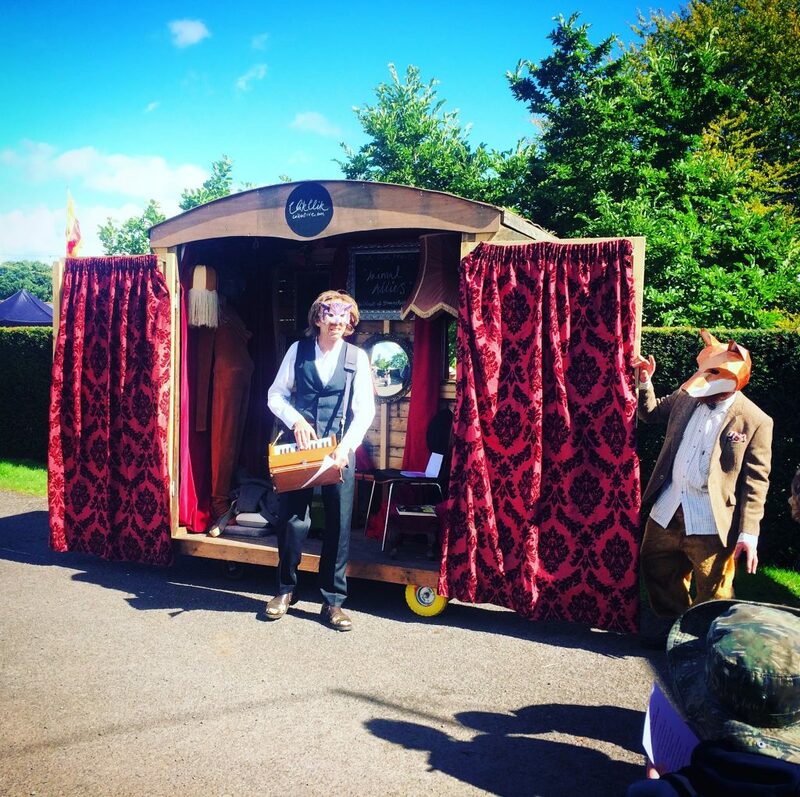 The Animal Allies encouraged you to take part in various immersive activities from sing-songs to ballroom dancing in and around the roaming wooden cart, all set in the fabulous Welsh coutryside of the Brecon Beacons. A kind of mirrored maze but whats inside? A truly strange experience which will make you wonder if it was actually all a dream! Just as you think you are confused enough by the mirrored path, you will stumble upon the inhabitants and see that they like to perform for you, even to get you involved and perform yourself! 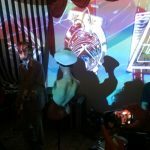 Asparafest – Evesham. June 2016/17. Two days of crazy capers, madcap mayhem and asparagus. 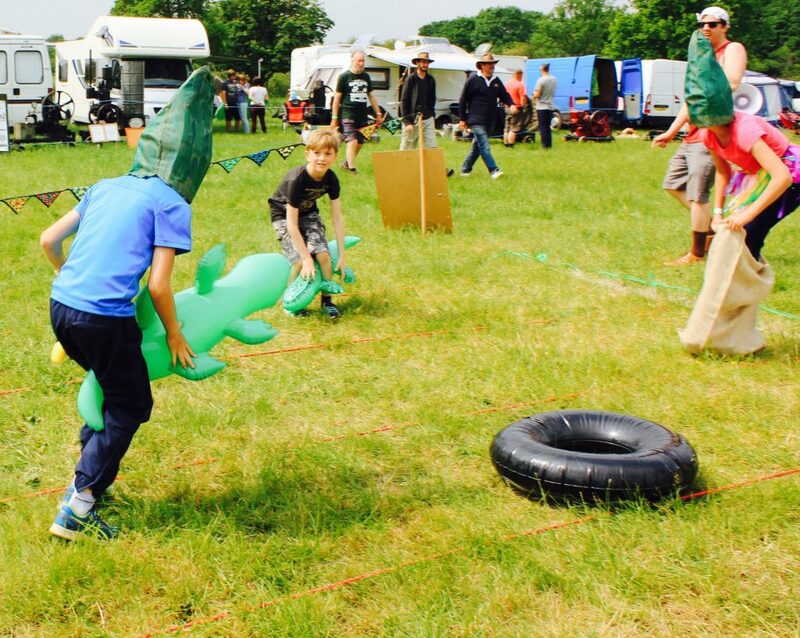 Think ‘its a knockout’ crossed with a school sports day, silly props and Clik Clik banter; welcome to the Asparalympics, a hilarious fun filled, all-ages pop up installation! With comparing from Jim Dale and Bob Sanderson, a fab character board by Keven Robinson and some large asparagusses made by Spare Room Arts. 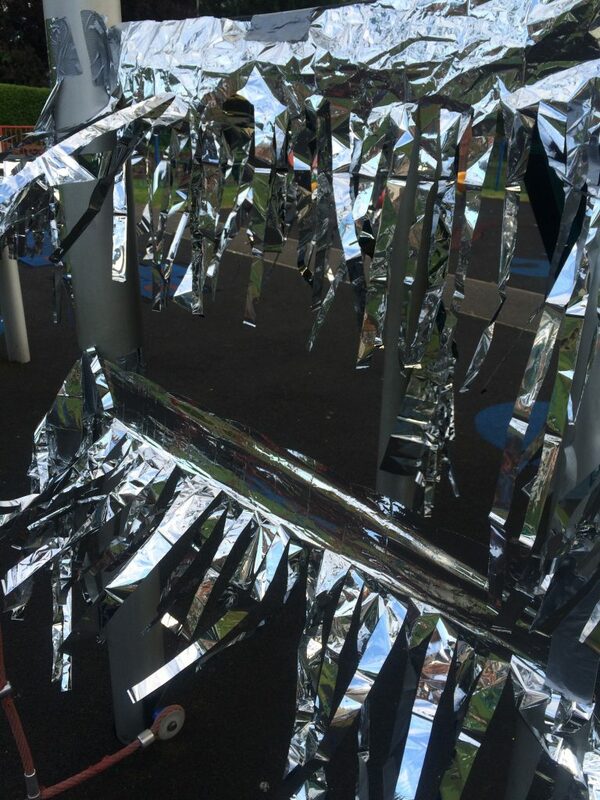 Drawing from the familiar aesthetic of 70s glam and disco, St George’s playground in Kidderminster was transformed temporarily into a glittery place for children and young people to explore, hang out and dance, whilst creating a place for adults to reflect and consider the relationship between adulthood and childhood. 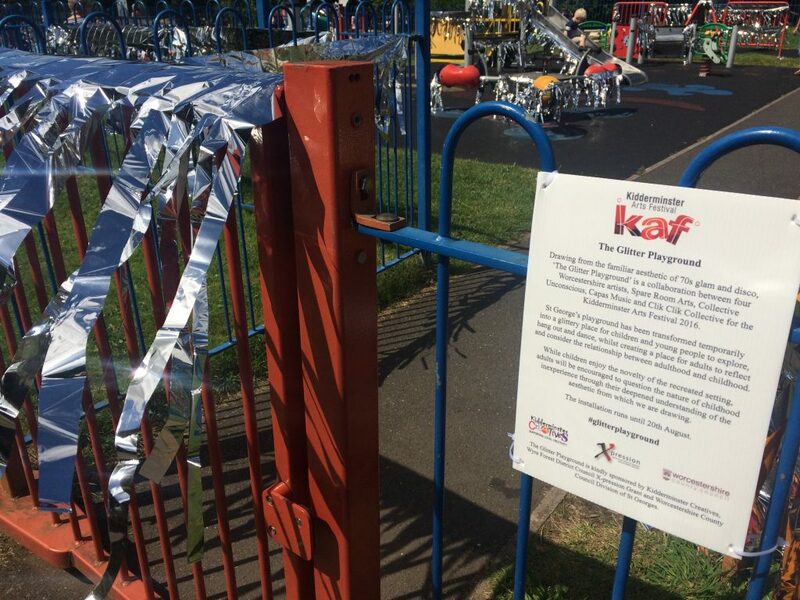 The project was funded by Wyre Forest District Council Xpressions Fund, Kidderminster Creatives and Worcester County Council Division of St Georges. 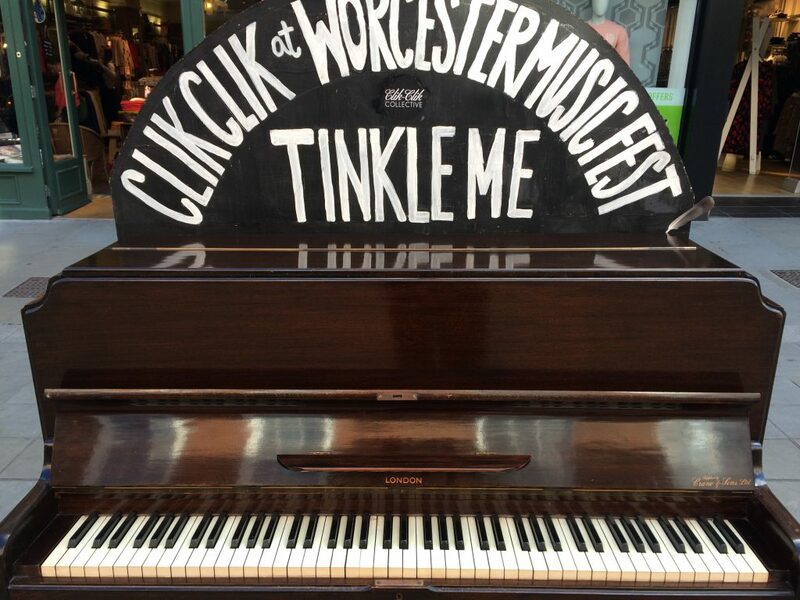 Each year, Clik Clik collaborates with Capas Music and the Worcester Music Festival to present several pianos in public areas of the city so that the community and visitors can ‘Tinkle’ those ivories. 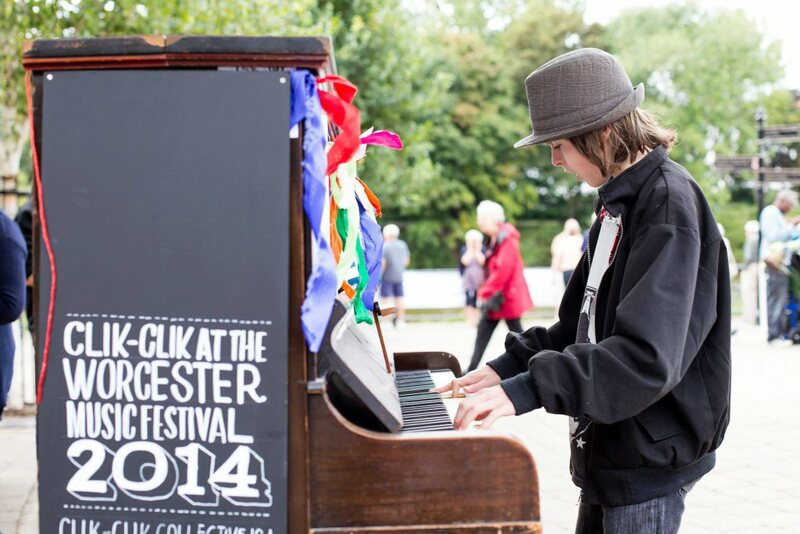 Public engagement is important especially accessibility to the arts, and each year there are fabulous stories from 13 year old honky tonk wizzes, to elderly Beethovens! The Cabinet of Broken Records. 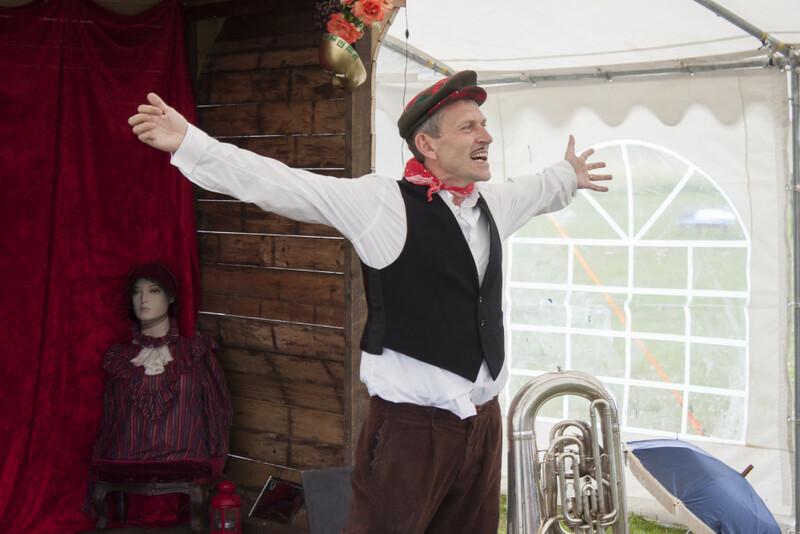 Summer Reading Challenge at Croome National Trust – summer 2015. 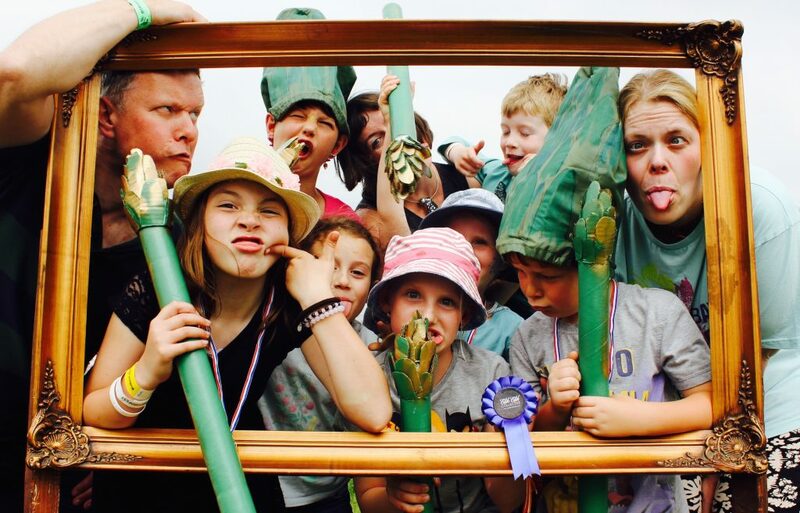 A day of record breaking took place at Croome NT in June 2015 as part of the Summer Reading Challenge, brought together by Croome and Worcestershire Liberies and Learning Service. Clik Clik put on a 40 minute show twice throughout the day which encouraged the public to attempt to break some silly records and have some fun, at the same time giving them some record breaking facts and figures through audience participation and with the Broken Records characters themselves! The Summer Reading Challenge brings together young people and performances to make a colouful series of events and activities making learning fun and accessible. There were also three Character Boards specially designed for the event, showing the rich history of Croome through the ages, hand painted by Keven Robinson and Sweetart Murals. 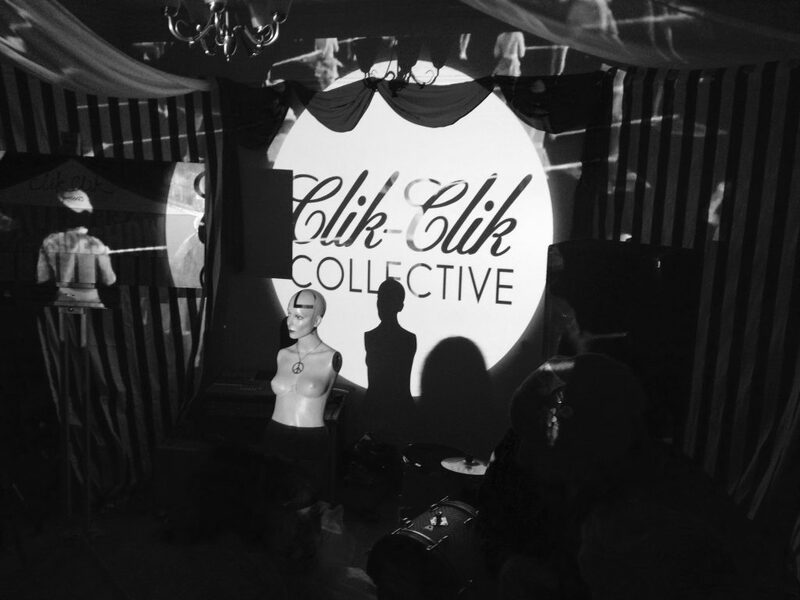 Clik Clik worked with Stephan Wilson, Stephan Bessant and Phil Wilkins.